To assess and quantify the magnitude of inequalities in under-five child malnutrition, particularly those ascribable to socio-economic status and to consider the policy implications of these findings. Data on 3765 under-five children were derived from the Living Standards and Development Survey. Household income, proxied by per capita household expenditure, was used as the main indicator of socio-economic status. Socio-economic inequality in malnutrition (stunting, underweight and wasting) was measured using the illness concentration index. The concentration index was calculated for the whole sample, as well as for different population groups, areas of residence (rural, urban and metropolitan) and for each province. Stunting was found to be the most prevalent form of malnutrition in South Africa. Consistent with expectation, the rate of stunting is observed to be the highest in the Eastern Cape and the Northern Province – provinces with the highest concentration of poverty. There are considerable pro-rich inequalities in the distribution of stunting and underweight. However, wasting does not manifest gradients related to socio-economic position. Among White children, no inequities are observed in all three forms of malnutrition. The highest pro-rich inequalities in stunting and underweight are found among Coloured children and metropolitan areas. There is a tendency for high pro-rich concentration indices in those provinces with relatively lower rates of stunting and underweight (Gauteng and the Western Cape). There are significant differences in under-five child malnutrition (stunting and underweight) that favour the richest of society. These are unnecessary, avoidable and unjust. It is demonstrated that addressing such socio-economic gradients in ill-health, which perpetuate inequalities in the future adult population requires a sound evidence base. Reliance on global averages alone can be misleading. Thus there is a need for evaluating policies not only in terms of improvements in averages, but also improvements in distribution. Furthermore, addressing problems of stunting and underweight, which are found to be responsive to improvements in household income status, requires initiatives that transcend the medical arena. There has been a recent upsurge of interest in socio-economic inequalities in health with the renewed commitment of governments and international organizations to improve the health of the poor [1, 2]. Growing scientific evidence points to the pervasiveness of socio-economic inequalities in health both between and within countries at any stage of development. The relationship between socio-economic status and illness and death is observed to be inverse, with morbidity and mortality concentrated in those at the lowest end of the socio-economic scale. Socio-economic inequalities in health manifest in all age groups. Studies have revealed wide socio-economic differences in rates of morbidity and mortality among children [e.g. 1, 3–4]. Avoidable inequalities in health during the early years of life deserve special attention, as they are likely to perpetuate inequality in the future adult population. The nutritional status of under-five children is one of the indicators of household well-being and one of the determinants of child survival . Child malnutrition is one of the most important causes of infant and child mortality [6, 7]. In sub-Saharan Africa, it accounts for about 2 percent of deaths and about 3 percent of disability-adjusted life years (DALYs) in under-five children . Malnutrition may adversely affect the child's intellectual development and consequently, health and productivity in later life [9, 10]. This is likely to perpetuate inequities and inequalities in health and other dimensions of household welfare. Child malnutrition is also one of the measures of health status that the WHO recommends for assessing equity in health . In countries like South Africa with high degrees of socio-economic inequality, the existence of morbidity and mortality differentials related to socio-economic status is not unexpected (see Table 1 for key indicators of South African Provinces). However, policies aimed at reducing inequities need to be based on a sound assessment of the nature, magnitude and determinants of the problem, as policy decisions based on intuition are likely to be misguided . The aim of this paper is therefore, to contribute to the efforts to quantify inequalities in health in South Africa, by assessing the magnitude of inequalities in malnutrition of under-five children that are ascribable to socio-economic status. The data used in this study is derived from the project for statistics on Living Standards and Development Survey (LSDS). This survey was conducted jointly by the South African Labour and Development Research Unit (SALDRU) and the World Bank in 1993. It was based on a sample of 8,848 households, which consisted of 40,284 individuals. The survey is designed to collect household data that can be used to assess multiple aspects of household welfare and behaviour and to evaluate the effect of various government policies on the living conditions of the population using a multi-topic questionnaire. The section on nutrition, besides questions related to child health, includes anthropometric measurements. For the purpose of this study, data on 3765 under-five children whose records were complete in the required individual and household level variables are included. The LSDS provides the most recent data set, which includes both anthropometric measures and extensive socio-economic indicators. The more recent Demographic and Health Survey contains extremely limited asset indicators, which are inadequate for detailed socio-economic inequality analysis. There are various ways of assessing the nutritional status of under-five children. It can be assessed using clinical signs, biochemical indicators or anthropometry . The anthropometric approach is the most commonly used tool  and is more advantageous compared to the other two . While clinical signs and biochemical abnormalities may only be useful in advanced cases of malnutrition, the anthropometric indicators are sensitive even in incipient ones. Furthermore, anthropometric measures are non-invasive, less costly and easy to obtain compared to the other two techniques. where, H i is the height of the child; H r is the median height of the reference population; and SD is the standard deviation of height of the same reference population. The World Health Organization recommends the US National Center for Health Statistics (NCHS) population as a reference for international use . This reference population, which has been in use since 1977 , however, has been found to have some technical and biological drawbacks, thus driving the WHO to conduct a multi-country study geared towards developing new reference values . iii. underweight: weight-for-age that is more than two standard deviations below the international reference value. Stunting is regarded as an indicator of long-standing dietary inadequacy. A high prevalence of stunting in the community is associated with poor socio-economic conditions . The WHO recommends stunting as a reliable measure of overall social deprivation . The height-for-age measure is less sensitive to temporary food shortages and thus, is the most reliable indicator of long-standing malnutrition in childhood . Wasting on the other hand reflects acute malnutrition. It has the advantage that it does not require an accurate knowledge of the child's age. This is particularly important in the setting of developing countries, where it may be difficult to get the exact age of the child. Wasting is also useful in evaluating the benefits of nutrition intervention programmes as it is sensitive to short-term changes (unlike stunting which does not respond quickly). Low weight-for-age is difficult to interpret, as it cannot discriminate between temporary and permanent malnutrition. However, in populations were the rate of wasting is low, it can be interpreted in the same way as height-for-age . Stunting and wasting are, thus the preferred measures of child nutritional status, since they can distinguish between long-standing and short-run malnutrition . In this analysis, outliers were removed in line with the exclusion ranges recommended by WHO . Hence, weight-for-height Z-scores less than -4.0 and greater than +5.0, height-for-age Z-scores less than -5.0 and greater than +3 and weight-for-age Z-scores less than -5.0 and greater than +5.0 are excluded from the analysis. Income is the most commonly used measure of socio-economic status (SES) . Given the difficulties of obtaining accurate income data in household surveys, household expenditure is frequently used as a proxy of household income. Indeed, household expenditure, particularly expenditure on basic needs of life, is the most frequently used measure of SES in nutritional analysis studies . Such expenditure is regarded as accurately representing the household's resource endowment that influences the health status of its members . Inequality in malnutrition is measured using the illness concentration index (C) proposed by Wagstaff et al . It is computed from the illness concentration curve (see Figure 1), which plots the cumulative proportions of children ranked by the household's socio-economic status against the cumulative proportions of malnutrition. It estimates the extent of socio-economic inequality in illness. The concentration index is similar to the relative index of inequality that is frequently used by epidemiologists. iii. it is sensitive to changes in the population across socio-economic groups. The concentration index is twice the area between the illness concentration curve (L(S)) and the diagonal with values ranging from +1 to -1. Its value is positive (negative) when it lies below (above) the diagonal. A negative illness concentration inde x indicates the existence of inequalities in health that are pro-rich (i.e. high income groups have less ill-health than low income groups). A positive concentration index implies inequalities in favour of the least advantaged socio-economic groups. If illness is distributed equally, the concentration curve overlaps with the diagonal (line of equality). R i represents the relative rank of the i th person. The individuals are ranked according to their socio-economic status beginning with the worst off. In the above equation β1 is equal to the concentration index. The overall concentration index is calculated (i.e. for all under-five children in the sample), as well as concentration indices for certain disaggregated categories including each 'race' group, area of residence (metropolitan areas, other urban areas and rural areas) and province. Thus, the distribution of malnutrition across per capita household expenditure quintiles is evaluated for each sub-group (e.g. rural areas). 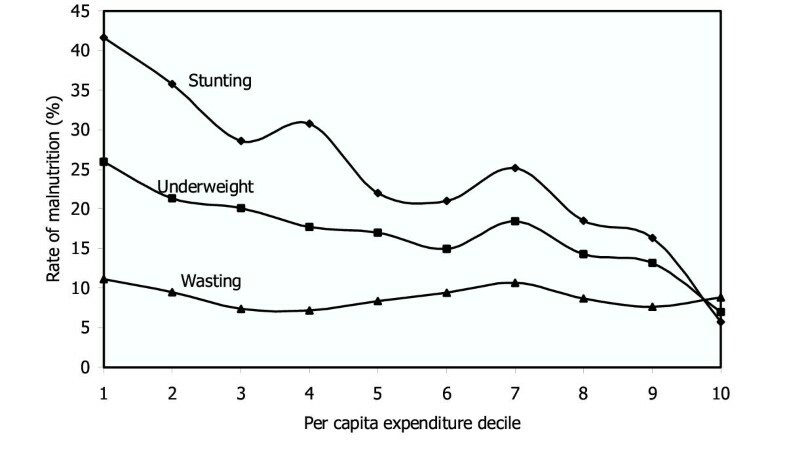 The rate of stunting is found to be the highest followed by low weight-for-age (underweight). The rate of stunting is significantly higher in male children (26.8 vs. 22.2 percent; χ2 = 10.6, p = 0.001). However, no statistically significant difference is observed in underweight and wasting between the two gender groups. 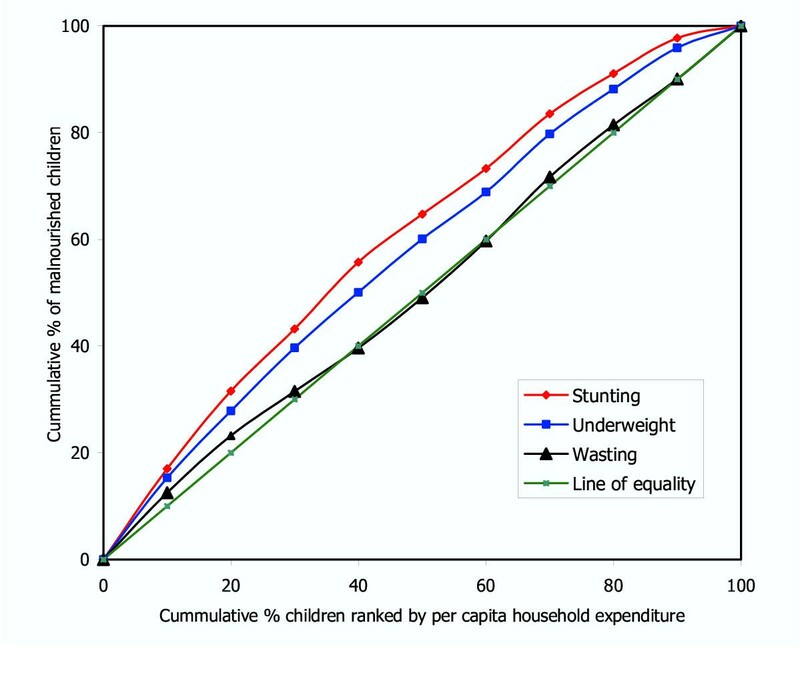 Closer examination of the three states of child malnutrition (Figure 2) reveals that while stunting and underweight are responsive to improvements in the socio-economic status of the household, wasting does not appear to be sensitive. Child malnutrition by per capita expenditure decile. Children from the poorest 10 percent of households have rates of underweight and stunting, which are about three and eight times those of the richest 10 percent respectively. Furthermore, the rates of stunting and low weight-for-age are highest among the African population group. Wasting which is a manifestation of acute and short-lived malnutrition, however, does not exhibit significant socio-economic differentials. There are wide geographical variations in the rates of the three types of child malnutrition, with the rate difference between the provinces with the highest and the lowest prevalence being more than three-fold. Stunting has the highest prevalence in the Eastern Cape and the Northern Province. These are the two provinces with the highest rates of poverty. The overall concentration indices for stunting, underweight and wasting respectively are -0.215, -0.152 and -0.019. The figures for stunting and underweight indicate statistically significant inequalities, which are pro-rich, that is those children in the lowest socio-economic strata bear a greater burden of malnutrition. However, this socio-economic gradient is not observed in wasting. For further clarity, this information is also presented using concentration curves in Figure 3. It is noted that income-related inequalities are the strongest in stunting (the stunting concentration curve is the farthest from the line of equality), an indicator of chronic malnutrition that is often associated with socio-economic deprivation. As expected, no discernible socio-economic inequalities are observed in wasting (the wasting concentration curve almost overlaps with the line of equality), as income has a little effect on the stochastic conditions (unforeseen environmental factors and diseases) which usually precipitate wasting. To gain further insight into the nature of the inequality, the concentration indices are disaggregated as shown in Table 2. Table 2 indicates that income-related inequalities in stunting and underweight increase monotonically with the increase in the degree of urbanisation of the household's area of residence. In other words, a dose-response pattern of relationship is observed. In all three areas of residence – rural, urban and metropolitan – the poorest bear the heaviest burden of stunting and underweight. However, inequalities in both stunting and underweight are lowest in rural settings and highest in metropolitan areas. It is further observed that although the rates of stunting and underweight are highest among African children, the pro-rich concentration indices are more pronounced for Coloured children (i.e. there are greater disparities in nutritional status across income groups within the Coloured population). Stunting and underweight concentration indices for White children do not manifest statistically significant socio-economic inequalities. For all population groups and places of residence, wasting does not show any gradients linked to socio-economic status. The findings also indicate that stunting has a remarkably high concentration among the poorest in all provinces (data for Northern Cape are not included due to the small numbers in this sub-sample). The pro-rich concentration indices for stunting have very high statistical significance in all provinces. Similarly, underweight concentration indices show statistically significant pro-rich inequalities in all but three provinces. In the Free State, Kwazulu-Natal and Mpumalanga provinces, underweight concentration indices do not exhibit income-related inequalities. Wasting does not show statistically significant pro-rich inequalities in all provinces except the Northern Province. Table 3 depicts this information. Table 3 also indicates the tendency for higher concentration indices to be found in those provinces that have relatively lower rates of stunting (see for example Western Cape and Gauteng). Thus, even though a relatively low proportion of children under-five in the Western Cape and Gauteng experience stunting, these provinces have the greatest disparities in malnutrition between income groups. In contrast, provinces such as Kwazulu-Natal and the Eastern Cape that have relatively high rates of stunting, have smaller differences in malnutrition across income groups. This study attempts to examine the socio-economic inequalities in health with special reference to under-five child malnutrition in an effort to quantify the inequalities. It is observed that the three states of protein-energy malnutrition (PEM) in children are a problem in South Africa, as much as they are in other countries in the developing world. The overall rate of stunting found in this study for both male and female children is similar to those reported for South Africa in other reports [21, 22]. The WHO Global Database on Child Growth and Monitoring indicates that a survey conducted in 1999 on a sample of 1556 under-five South African children reveals rates of stunting, underweight and wasting in children between the ages of 1–4 years, which are not very different from the current findings. This conforms to the trend seen in many African countries, where the rate of decline in stunting has been slow . As in many other countries, stunting is the highest problem, followed by underweight and wasting [see for example Table 2 in ]. The aggregate prevalence rates conceal vital information, and hence do not give a realistic picture of the prevailing situation of PEM. Thus, disaggregating by various indicators of socio-economic status is vital in generating valuable information for policy decisions. The rate differentials in all forms of under-five child malnutrition except wasting are highly pronounced when decomposed by various indicators: socio-economic, demographic, and geographic. The household's economic position is seen to have a highly significant impact on the probability of a child being stunted and underweight. The inverse relationship that is observed between stunting and household's socio-economic status has been well established in the literature. For this reason, the world Health Organization recommends stunting as a measure of overall social deprivation and as one of the indicators to monitor equity in health [14, 11]. As one moves up the income ladder, a remarkable drop in the rate of stunting is observed. Improved household income levels are associated with a dramatic drop in the probability of stunting of children. Several studies have indicated that increasing the income of the poorest is a sound strategy to curb the high rates of stunting in the socio-economically deprived segments of the population [e.g. 25, 26]. In the same vein, recent studies on the effects of South African old age pension on the health of households indicate positive outcomes including child nutrition . Hence, to address inequities in stunting and underweight, which are likely to continue the cycle of inequalities in income in the future, the implementation of income-generating projects and direct transfers of income to the poor are indispensable measures that must be pursued aggressively. Malnutrition, especially stunting, has a more socio-economic dimension, and therefore, should be viewed in a broader context and not merely in a narrow biomedical sense. Systematic inequalities in long-standing under-five malnutrition have far-reaching consequences. Studies have indicated that malnutrition contributes to a significant reduction in lifetime earnings . Consequently, this is likely to perpetuate the already high levels of income inequality in the country. While government efforts such as the Primary School Nutrition Programme (PSNP) targeted at school children can offer palliative measures to mitigate the problems associated with school child malnutrition (such as school drop out and ultimately contribution to the improvement of academic performance), they can not have a profound and sustained impact in addressing the deep-rooted proximate determinants of malnutrition. Furthermore, long-standing malnutrition, especially during the pre-school age is likely to result in irreversible damages to the child's intellectual development. Hence, focus on this age group is essential, as it has a substantial pay-off in the future. 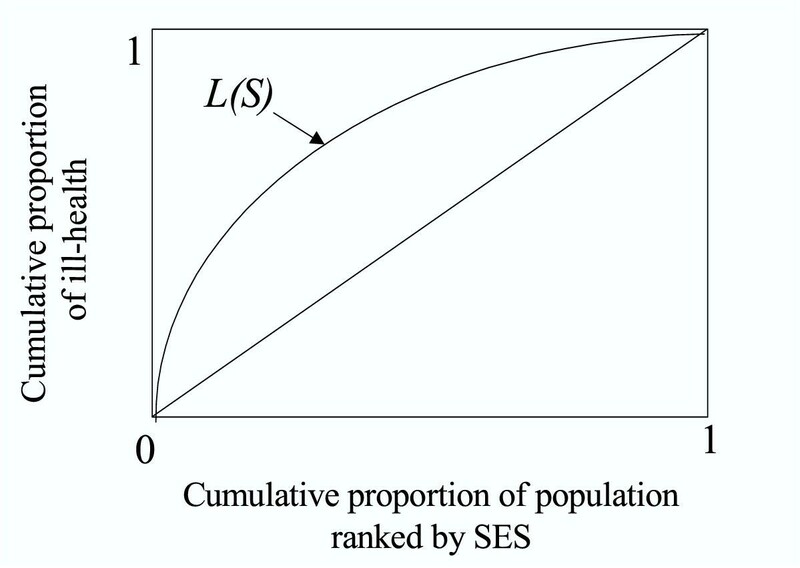 A similar pattern is also observed with respect to population group. The groups who are regarded as historically most disadvantaged (Africans and Coloureds) have rates of stunting, which are in stark contrast with those of Whites. The rates of stunting and underweight in African children are more than five times those of White children. This may partly be explained by the wide income inequalities between the various population groups. Variations between areas of residence, with considerably higher rates of stunting and underweight in rural than in metropolitan areas, are also partially attributable to the rural-urban income differential. While these disparities (especially between population groups and geographic areas) are not unexpected within the South African context, the present analysis adds valuable additional insights of policy relevance by a disaggregated concentration index analysis. The overall concentration indices for stunting and underweight are substantial and statistically significant. They indicate that under-five children from the poorest households bear the greatest burden of malnutrition. Even though this finding is important in its own right, its policy relevance will be further increased if concentration indices are computed for various categories. When seen by population group, the pro-rich concentration indices for stunting and underweight are substantial and statistically significant in Coloured children. While the concentration indices for White children do not have statistical significance, those of African children are considerably lower than those of Coloured children, even if they are statistically significant. An important policy implication emanates from this finding. If policies aimed at reducing child malnutrition are based only on average rates, they will target mainly African children, as they have rates of underweight and stunting that are profoundly high compared to the other two groups. However, this will lead to errors of omission in targeting, as the relatively higher concentration indices in Coloured children imply that those coming from the poorest households are no better than Africans from the poorest households. Thus, it is imperative for policy makers to take account of not only inter-group differences, but also intra-group rate differentials. The present finding suggests the need for focusing not only on African children, but also the poorest of Coloured children. A similar phenomenon is observed with regard to area of residence. While the rate of stunting is the highest in rural areas, the pro-rich concentration indices are the highest in the metropolitan areas – more than two times. This underscores the need for targeting pockets of abject poverty in the metropolitan and urban areas. This finding is in keeping with those of others, who have demonstrated the existence of substantial concentrations of ill-health among the urban poor. The fact that urban populations experience more variations in nutritional status, poverty, morbidity and mortality compared to rural populations has been shown by a number of studies [29, 30]. Basta  has argued that using global averages to characterize poverty and child malnutrition in urban areas may be misleading, because city averages do not capture the large heterogeneity found between social classes in urban areas. Hadad et al  using the Demographic and Health Survey (DHS) data for a dozen developing countries in Africa, Asia and Latin America also demonstrate that the ratio of stunting prevalence between the poorest and wealthiest quintiles is greater within urban than within rural areas. In the same line, Menon et al  used DHS data for 11 countries in Africa, Asia and Latin America to test the hypothesis that socio-economic differentials in stunting are consistently larger in urban than in rural areas. Their findings unequivocally supported this hypothesis. Thus dependence on global averages can be particularly misleading in countries like South Africa with high levels of socio-economic inequalities. The above argument applies equally when the rates and concentration indices of malnutrition are decomposed by province. There is a considerable socio-economic inequality in stunting that favours the rich in all provinces. The rate of stunting in the province with the highest figure is almost twice that of the province with the lowest stunting rate. However, the concentration index of the province with the lowest rate is more than twice that of the province with the highest rate of stunting. Provinces such as the Western Cape and Gauteng with relatively lower rates of stunting have pro-rich concentration indices, which are the highest. On the other hand, provinces such as the Eastern Cape and Kwazulu-Natal that have relatively higher rates of malnutrition have the lowest concentration indices. Thus, any programme or intervention that aims at reducing under-five child malnutrition has to also consider provinces with high intra-province concentration indices in order to avoid undercoverage of those who deserve it. Hence, in addition to its focus on those provinces with relatively higher rates of stunting, government should also give due attention to those with lower rates of stunting but relatively higher intra-province variation. In summary, this paper highlights the existence of significant differences in child malnutrition (stunting and underweight) that are unnecessary, avoidable and unjust. Malnutrition affects child survival negatively [5, 6]. It may also adversely affect health status and productivity in later adult life . Thus, the repercussions of socio-economic inequalities in child nutritional status are likely to be self-perpetuating. The lack of a well-timed and targeted action against socio-economic inequalities in child nutritional status may have a neutralising effect on policies that are intended to rectify socio-economic injustices inherited from the previous political system. Hence, in South Africa, there is a pressing need for policies to remedy this situation as part of the overall efforts to redress past inequities. The study also demonstrates that reliance on global averages can be misleading if not used concurrently with inequality measures.